WASHINGTON. Jan. 31. A.A.P. - Tests to determine whether "space ships" can become a reality will be conducted by the Army shortly. As part of the tests 15 Nazi V2 rockets will be fired straight into the air. They will be equipped with various scientific recording instruments. which, it is expected, will be freed and parachuted to earth before the projectiles explode. 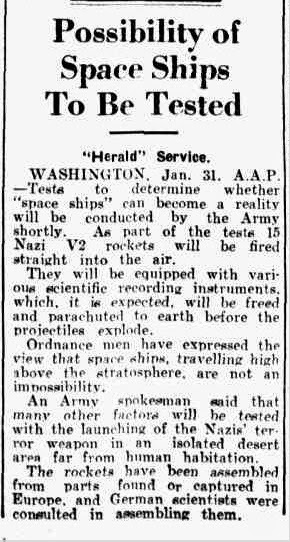 Ordnance men have expressed the view that space ships, travelling high above the stratosphere. are not an impossibility. An Army spokesman said that many other factors will he tested with the launching of the Nazis' terror weapon in an isolated desert area far from human habitation. The rockets have been assembled from parts found or captured in Europe, and German scientists were consulted in assembling them.